Clara.io: the power of your 3D software in the cloud? Exocortex Technologies’ Clara.io. The new online tool, currently in beta, aims to make functionality familiar to users of desktop DCC packages accessible via a standard web browser. 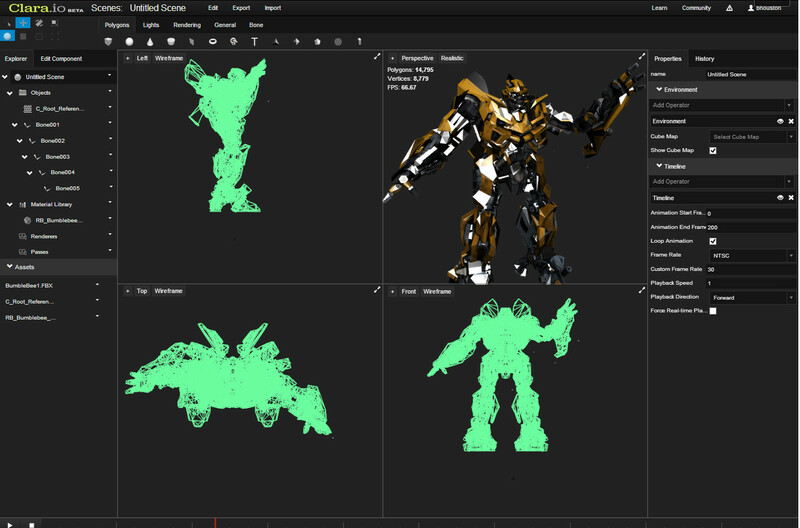 Exocortex Technologies has announced Clara.io: an ambitious new cloud-based 3D content-creation tool that promises to let you do in a web browser what you would normally do in software like 3ds Max or Maya. Unlike other new cloud-based services like Lagoa, the system is not specialised on a single task, but has a feature set more similar to a standard desktop DCC package. Those features include a scene graph; poly modelling and UV mapping tools, including modifiers and sub-object editing; bones and skinning; keyframe animation; lights and cameras; and a pass-based render system. 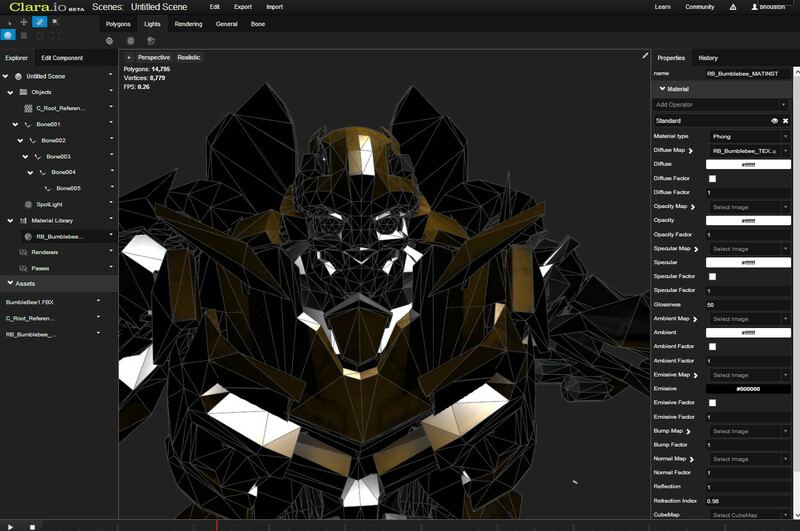 Files can be uploaded in a range of standard formats, including FBX, Collada, OBJ, STL and ThreeJS, and Exocortex says that the toolset is designed to be extensible through plugins or scripts. On top of that, you get a few things you don’t get as standard in desktop software, like real-time multi-user collaborative editing and automatic versioning with history. In the teaser screenshots, Clara.io’s interface looks reminiscent of desktop 3D tools, with menus labelled Polygons, Lights, Rendering and Bone, but significantly simplified. The screenshots on Exocortex’s blog show an interface that will be familiar to users of desktop 3D software, although a much simplified one. That probably has something to do with the fact that Clara.io is still in beta – but perhaps also a conscious attempt to do away with some of the clutter that has crept into desktop 3D applications over the years. According to Exocortex: “We have removed the headaches that all of us in the profession know too well, headaches that were understandable back in 1995, but not nearly 20 years later. Sounds great: how well does it really work? As a concept, Clara.io is a pretty attractive one: a system with the power of conventional desktop 3D software, but one that requires no configuration, works on any hardware, is available anywhere in the world, and that lets you collaborate with other artists in real time. How well it works in practice is another matter: Exocortex has only just begun accepting applications to the beta program, although the site does include an enthusiastic testimonial from Blur Studio’s Douglas Lassance. However, the company has a strong pedigree in VFX tools, mainly for Softimage, with a product line-up that includes fluid simulator Slipstream, multi-physics system Momentum and character-creation tool Species. It also has also collaborated with key players in the world of next-generation tools development: the company teamed up with Lagoa founder Thiago Costa for Slipstream, and Fabric Engine‘s Helge Mathee for Momentum. All in all, Clara.io has the potential to be something far more revolutionary than just another 3D package. It will be fascinating to see whether it can live up to that potential.